Fixed mixed restorations are frequently realized in prosthodontics. The purpose of the study was to analyze comparatively the frequency in realization of fixed prosthetic restorations, represented by metal-polymeric and porcelain fused to metal bridges, in private practice, in patients living in rural and urban area. 95 patients, 42 of rural and 53 of urban area were selected for this study. 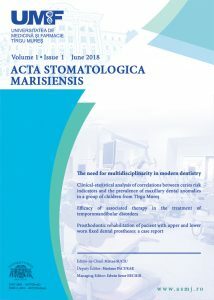 The selected clinical cases were compared after the achievement of prosthetic restoration (metal-polymeric and porcelain fused to metal bridges), to determine the causes of choosing of the type of prosthetic treatment plane. The selected patients received 114 fixed mixed restorations, represented by 70 metal-polymer (FMMP) and 44 porcelain-fused-to-metal (PFM) bridges. The distribution of FMMP restorations were 59 for patients of rural area and 11 for the patients of urban area. All 44 PFM restorations were achieved for the patients of urban area. In some situations, the adopted prosthetic treatment plan may represent a compromise solution in terms of the optimal resolution of the case, due to the local or general particularities of patients, or due to the objective/financial factors.